Twitter can be a wonderful tool. It’s great for networking, establishing relationships, and finding out about news and new ideas. It can also feed a blog. A few weeks back, Otakurean, Prede and I were tweeting, and Otakurean mentioned that the father in Serial Experiments Lain was symbolic of God. I was confused at first – although the show was once one of my favorites and still one I admire greatly, it’s been almost 10 years since I’d seen it and I’d forgotten much. Wasn’t Lain symbolic of God? And wasn’t the father just a creepy dad? It wasn’t until after I rewatched the final episode that I got the connection. Of course, Serial Experiments Lain is apt for discussion in a variety of arenas – media, technology, culture, society and relationships in addition to religion. Although I’m sure it’s been discussed to death, I can’t help but write about a connection between the show and Christian spirituality that stood out dramatically. In the final episode of the series, Lain embodies the role of Jesus Christ when He is at the Garden of Gethsamane, hours before His execution. On the night of Jesus’s betrayal by Judas and his capture by the Romans, He went to the Garden of Gethsamane to pray. The Bible says He was sorrowful and troubled (Matthew 26:37). This is a perfect description of Lain as well, when she struggles with the decision to erase herself from the memory of humans. She fights with herself, wondering things like, “Why do I exist?” She is literally at conflict with herself as she talks and argues with a doppelganger. Lain knows what she should do, but seems to be struggling with going through with her decision. Jesus, too, struggled in the moments of His fateful decision. The Bible says He was in anguish – His sweat was like drops of blood (Luke 22:44). Those who were with him slept through most of the prayer, but must’ve been awake to hear (and record) Jesus say, “Father, if you are willing, take this cup from me; yet not my will, but yours be done” (43). Jesus didn’t want to die, but would rather die than disobey His father. Lain, similarly, didn’t want to be erased. We don’t know what else Jesus said or what was going on inside His head, but we know there was struggle between what was right and what was convenient. Here is where the hammer hits the nail on the head. Jesus died for everyone. The great equality in Christianity is that Jesus died for Jew and Gentile alike. He loved everyone. Lain, too, loves everyone, and sacrifices her life, in effect, because of that love. Her father understands her true feelings. Through speaking with her dad, Lain gathers strength to do what she will. Jesus, too, gathered strength through speaking with His father. After Jesus’ prayer, all his anguish faded away. It is possibly the most important moment in human history, where Jesus decides whether to continue in perfection or follow His own path. And after making the decision, Jesus turns from sorrow to confidence. In fact, throughout the rest of the death and resurrection narrative, Jesus is always the figure most in command and the One most confident – in the face of certain horrible death, he stands strong and doesn’t waver. The struggle was in the prayer. For Lain, the struggle, too, was in making the decision. Once she follows through, the rest is easy, as is demonstrated by Lain’s angelic expression and easy dialogue after she wipes humanity’s memory of herself. Jesus the Savior. Lain the savior. Both struggled and came out on top. The topping on the cake is in the dessert itself – I don’t know if Lain ever had tea and a madeleine, literally, with her dad, but the offer of comfort was there. Jesus, after He died, went to sit with His own Father, to fellowship with Him as well. God is in His Heaven, Lain is in her Wired, and all’s right with the world. Well, those words from Lain’s Dad at the end definitely are suggestive of this. I need to rewatch this series before long!!! It’s really one of those series that needs reviewing to capture everything…I only rewatched that last episode, but it makes me want to view it all over again, also! Wow that’s very insightful. I have to say, after reading what your wrote, remembering the scene, and reading what lain’s father said, I think you totally hit the nail on the head. what you wrote made perfect sense. The moments where Lain is contemplating erasing herself from everyone’s memory is very much like when Jesus was troubled before he was killed. Random thought: madeleine and tea…could be similar to the bread and wine? Although what you said also makes a lot of sense. In fact I like looking at it the way you do. AHHH, bread and wine! Man, what a terrific connection! In fact, that’s so dead on that it makes me wonder if Abe and the others were really thinking of Jesus specifically when doing these scenes. Gahhhh…I wish I’d thought of that. I suppose the connection could be made (though it would be a leap) that the father was making an allusion to the physical sacrifice – Lain no longer being part of the real world, as Jesus would give of his blood and body. Kino’s Journey will DEFINITELY be written about. I’m only four episodes in, but I’ll let you know once I write it up – probably near Christmas. I’m afraid I think “madeleines” were merely a reference to Proust and Remembrance of things past, which begins with a discussion of how the taste of madeleines brings back many memories. But, otherwise, a nice post. I will have to keep it in mind the next time I watch Lain. Day 2 of 365(355) days of aniblogger | beneath the tangles | Otakurean? Wow, this is amazing. I think Christians are naturally drawn to Christian animes, I’m saying that in the sense that Christians can identify with these animes. SEL is one of my favorites, and Kino’s Journey is on my to watch list. Thanks for this! May I ask what type of church you go to? Thanks – I’m glad you like it! Sans this one particular section, I haven’t seen Lain in many years, but it’s still a favorite. I go to an Asian-American Baptist church. You’re welcome. I didn’t get your reply. That’s odd, I should have. Anyway, thanks for the church type info. Have you written about Ergo Proxy, Texhnolyze or Ghost in the Shell? I haven’t seen Texhnolyze, though it’s definitely on my list – along with Lain and Haibane Renmei, two of my favorite series (I’ve written a bit on the latter), they’re kind of the holy trinity of ABe works. I haven’t seen Ergo Proxy either or the Ghost in the Shell series – again, I’m particularly interested in one day watching the latter. I think you probably just have to do some searching – I know there are plenty of cyberpunk fans that are also anime fans; otherwise, you wouldn’t have successful shows like Last Exile and movies like Steamboy. I also remember participating in a conversation on the CAA boards where some of the responders seemed to know the subject area pretty well. CAA? Last Exile and Steamboy are Steampunk. SEL, Ergo Proxy, GIST, Texhnolyze are cyberpunk. I’m the latter although I appreciate the former. I know the subject area well, I just want companionship. I have one friend from MAL I email with, but that’s it right now. Woops, sorry, I misread you. I really haven’t seen any cyberpunk/anime related blogs or groups, or any particular fans of the genre. But there probably are some out there – they just may not be particular vocal. Ergo Proxy and GitS were very popular series, after all. Bubblegum Crisis was also popular in the 80s (the 90s reboot was horrible, though, I thought), so there may be a far-reaching fandom. Can you tell me what the CAA boards are? CAA = Christian Anime Alliance (http://www.christiananime.net/index.php). Great! I’d certainly love to read your thoughts, if you ever decide to blog. I posted my first entry. I will work on my blog during the week when I’m alone. I found four central questions: as in any cyberpunk tale, the first was if the virtual and the real can merge, diffuminating the barrier between being and thinking, body and mind. The second was if in such a world we humans do need a body, or are better off being unlimited minds. The third one was decisive for us: Who is Lain? Ergo, who are we? We saw the same character with different roles, different voices, contradictory attitudes, so we couldn´t know for sure which one was real, or what was in her mind. And the last one was the “Homo Deus” question: if a man can trascend of any physical boundaries and become sort of a programmer of all this merged reality, is he God? That are important questions. The first one is present as a project in our imaginary since the Enlightenment, the transhumanist “emancipation from Nature” is a driving force of our modern culture, the last one is the current objective of Noah Harari and a lot of influential secular humanist thinkers. 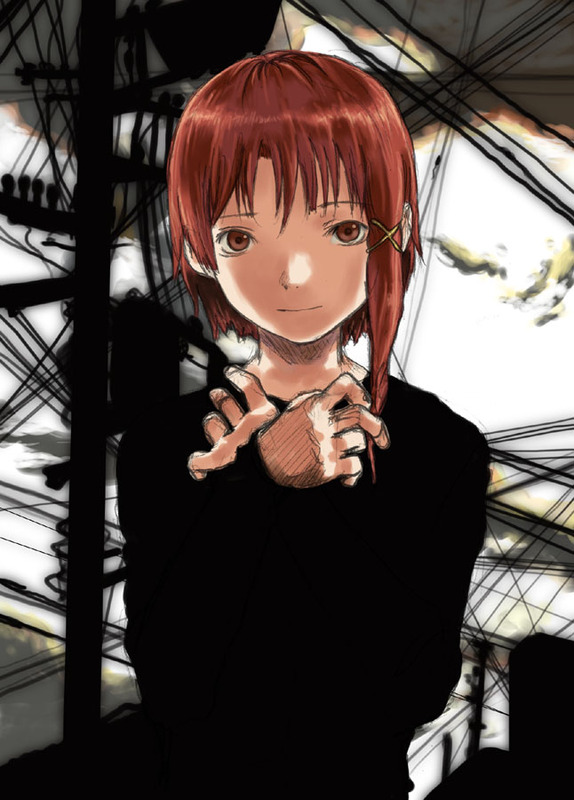 In the anime series, Lain was the center of the trascended/Homo Deus/scientific genius Eiri Masami´s experiments conducted with the help of his secret online society, the Knights, which point to the full success of the mixing reality process with Eiri as a God. Lain is meant as a sort of symbol or messiah figure destined to connect all people in a creepy, alienated and cold world. Without knowing, she had been generated as a “separated mind in the Wired which generates a body” through collective mind experiments, put in a fake family (which was part of the experiment), gradually accepted her “calling” and began a public proccess of “trascendence” in the Internet/Wired. The series comments on various forms of possible, very real modern alienation: teen suicide, drugs, disco (Cyberia), hacker activities, online games, allucinations, conspirancy theories, online gossiping, fake personalities, superficial relationships. And in the end, delivers the answers. The key player here is Arisu, a normal classmate of Lain who is kind and really cares about her, unlike her other “friends”. It´s Arisu who lets us see the real Lain time after time until the final scene, because human beings can only be seen through kindness, friendship and love. She doesn´t know anything about the conspirancy, virtual reality or the experiments, she is afraid, but she cares. Holding Lain, she provides the second answer: Mrs Ikawura had said that the body exists only to verify one’s own existence, she denies it, “that´s wrong”: there´s physical contact, physical appareance, as a way to the real person (the best development of this reasoning I have seen it´s done in Steinbeck´s “King Arthur”, in the dialog between Lanzarote and the Queens). But the definitive proof is the subsequent attack by Eiri Masami, whose fleshlessness has turned into a dantesque and ever-changing criature who seems to have scaped from El Bosco´s paintings. But the real deal it´s just after that. Arisu has changed Lain´s mind, so she turns to Masami and tells him that he cannot be God, because there´s already one who originated the Universe and put there the very original conditions for the existence of the Wired and all the rest. Yeah. I was astonished, never expected something like that. Eiri Masami is infuriated to hear this, and that´s the attack I talked about just now. Lain triumphs and destroys him, but now the merging proccess is near its conclussion. Lain has a power greater than Masami´s had, and the only possible way to avoid the general “trascendence” and mantain Humanity´s existence as it is is for her to be erased from the mind of everyone, Madoka style, and watch for them all. She suffers as you have pointed, then decides because she loves everyone. I think that althought this is parallel to Christlike sacrifice, it has also somewhat Buddhist overtones (also like Madoka, which I think has a similar incomplete-Christlike-but-most-Buddhist-inspiration): you´re “supressed”, in a way, your evil dopplegänger (in Madoka, the witch) is destroyed, you join the unlimited, the good, but there is no resurrection. Still, I find redemptive value in these animes and non-Christian works where tragedy is avoided by rejecting the prideful idea of being “godly”, sacrifacing, accepting our human, limited condition, the help of others and even trusting God, or the higher good they can see. In my watching, I understood the scene you have pointed out as the encounter between Lain and that God she has mentioned just after, and there was my second surprise: that God resembled her dad. Her real dad had been as cold and creepy as you say, definitively a part of the experiment, but ultimately came to love her, “I wasn’t really given permission to tell you goodbye. But then I had to. Because, you see, I loved you”. Lain always weared that bear pajamas while being alone in her creepy room, with the only company of the computer: now she don´t have to anymore, she is not alone. But now her dad smiled, and offered her a seat, and understood waht she could not say, and offered to bring her that Proustian madeleines (which in Proust meant happy childhood memories, if I´m not wrong). For the first time in the series, someone other than Arisu treated her not like a godess, not like a threat, not like a weirdo, not like a specimen, but like a person, like a child, like a daughter. No wonder she cries. In Lain, thought ambigously, our fragile love prevails over power, “trascendence” and chaos as the true meaning of the world. So Lain carries out with her sacrifice, and she and a married Arisu who does not remember her meet and the end. And Arisu is kind as always, living a happy, human life, and Lain watchs her and is happy too… Oh, man. It was a wonderful series. I just have finshed Toradora, by the way, and I was truly amazed by Kushieda. Such a hero. Now I´m watching Tsubasa Reservoir Cronichles for a turn. God bless Beneath the Tangles! Thank you for the extensive commentary! 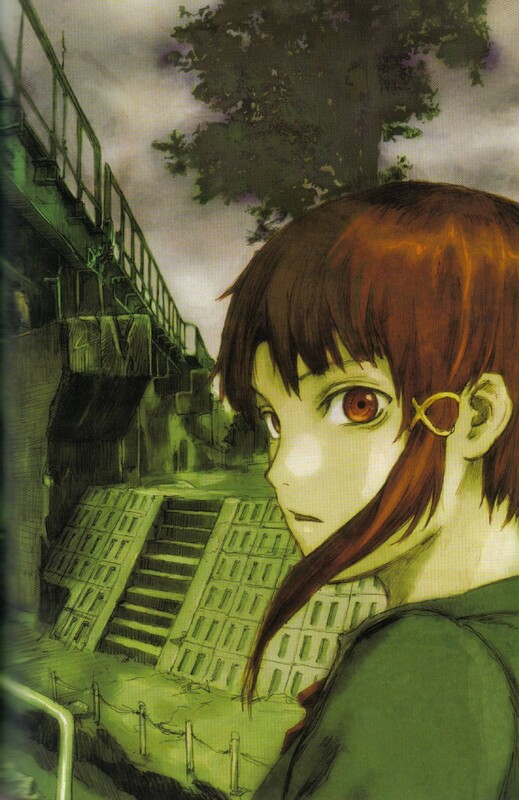 It’s been a long time since I’ve watched Lain (and possibly time for a revisit), so it was wonderful reading about much of what makes this series so special, and to read about a number of thoughts I’m sure I hadn’t considered when I watched it. I especially like your thoughts about Arisu – she is a special character, and I don’t think I had really considered why I thought such until reading the connections you made.